Red-winged blackbirds are named for the males' red shoulder patches, which they display as they perch in cattail marshes and compete with other males for territory. Females are streaked brown, like many other female birds, and without red patches. 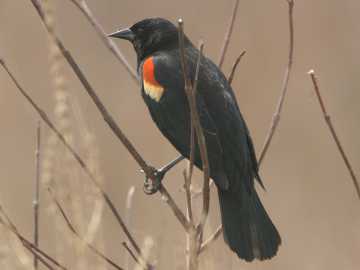 It's a sure sign of spring when red-winged blackbirds begin returning to our cattail marshes in March. Red-winged blackbirds (Agelaius phoeniceus) are among the earliest migrating birds to return. They come and go like clockwork – with a few adjustments for the weather. Last year they were back around March first. But with this year's cold weather, they're just now returning. They usually leave again by September. Males and females return at different times. The males come back first. They set about establishing territories, often in the same cattail marsh or wet field as in past years. One marsh or wet field can hold several territories, so group living – with its safety in numbers – is typical. There's much singing, slow gliding from perch to perch, and posturing as the males define and defend the borders of their territories. They spread their wings and flash the red shoulder patches on their wings – their "epaulets" – to warn away other males. Two males may meet at the border of their territories and pose with their bills pointed upward and their red patches flaring, until one of them flies away. The females return a couple of weeks later. They're shaped like the males, but they're brown and streaked – not at all conspicuous like the showy males. It's for their benefit that the males have been so busy competing for territories. In the serious business of pairing up, the females are the ones that choose – but they choose a territory, not a particular male. In their search for the best territory, females may not even come back to the same marsh every year. More than one female may choose the same male's territory, if it's a good one. The result is that males may end up with several females. Scientists who study birds consider red-winged blackbirds to be polygynous, meaning "having more than one wife at one time". A male may have as many as 15 females on his territory, but the average is closer to 3 to 5. Some males have only one female, and others may have none. What makes good territory? It needs the right water level, good cover for nests, and plenty of food, such as dragonflies, damselfies, and other insects that provide protein for growing chicks. These resources increase the odds that a female will successfully raise her young. The females' own nesting territories are relatively small, consisting of the area immediately around the nest. Several may fit inside a male's larger territory. Females defend their nesting territories from other females. Females build their nests in the cattail reeds or in shrubs, weaving grasses around several reeds or branches to hold the nest safely above the water. They may raise two broods of about 3 to 5 young in a season. Males defend the nests and the young and help to feed the chicks once they've left the nest. Surprisingly, one-quarter to one-half of the chicks in a nest may not be fathered by the male that defends the territory. They're the offspring of neighboring males. How can anyone possibly know this? Researchers have done DNA studies of eggs and chicks, revealing their paternity. To watch for returning red-winged blackbirds and observe their busy group life, look for cattails (Typha latifolia). Or check where you've seen purple loosestrife (Lythrum salicaria) in the summer, because the same area may contain cattails that are being gradually replaced by the invasive loosestrife. Remember to keep a respectful distance away so you don't disturb the nesting birds. Binoculars can be helpful. Westborough has cattail marshes off Route 30 opposite Uhlman's ice cream stand, along Rte. 9 between 135 and Otis Street, and in places along the edges of Mill Pond, for example, near the boat ramp on Mill Road. Anyone who paddles a canoe or kayak up the Sudbury River from Fruit Street toward Cedar Pond in early spring is likely to get a close view of red-wings. Red-winged blackbirds routinely set up housekeeping in the retention ponds at Gibbons School. You may also find them nesting in small roadside cattail areas. Their use of these small wet areas is evidence of one reason for their success in living alongside humans. They are able to use fragmented habitats, such as small pockets of cattails. As with so many birds, a good clue to red-winged blackbirds' presence is their song. If you're out walking, you'll probably hear them before you see them. The males' song is a distinctive gurgle and buzz, often described in bird books as "konk-a-ree" or "ook-a-lee". Males typically have four to six versions of their song, and they switch from one to another. Young males learn their song from other males. A cattail marsh full of red-winged blackbirds is a busy and noisy place. At first the males sing and display for one another, and later on they also sing and chase females. Males and females actually sing duets together, with the females adding their own notes to the last half of the male's song. Red-winged blackbirds also have numerous calls. They include contact calls between males and females, alarm and distress calls, courtship calls, and feeding calls used while feeding the young. Sometimes a particular call spreads like a wave among the red-wings in a marsh. Toward the end of the summer, in August, the marshes go silent. The red-winged blackbirds may hide among the reeds while they molt, or they may leave to gather in more secluded areas. Once their new feathers are in, males and females form separate flocks to migrate south. The young join the females. Group living continues, but separately for the sexes. In other, more open parts of the U.S., red-winged blackbirds can be easier to find than in our area. The birds travel and roost in large flocks. In some areas they become agricultural pests when flocks descend on fields of corn, grain, or rice. But for us, they're a sign of spring and consumers of insects and weed seeds.